Pigmentation – works to lighten and whiten the skin. Painless Laser Facelift For: A Fabulous treatment to help rejuvenate the face, neck and décolletage. There is no pain or downtime and can be done on any skin type. A painless Laser light is used that treats fine lines and wrinkles while also shrinking the appearance of pores, diminishing acne scarring and improving small veins, vessels and redness brought on by Red vessels. The Beauty of this treatment is that it allows microscopic beams to penetrate deeply to stimulate the production of collagen, decrease the pigmentation. The procedure is pain free and without downtime. The laser light is gentle enough to treat areas previously considered too sensitive for such laser treatments such as the skin around the eyes to help the appearance of dark circles and to tighten the eye region skin. A super-fast treatment: It can take anywhere from 30 minutes for the full face to 1 hour for the face, neck and chest. 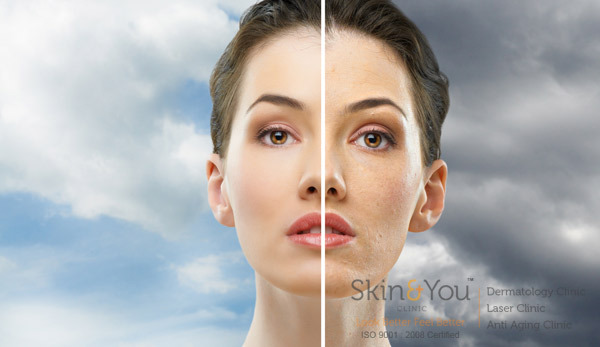 Why Skin & You Clinic for photo facial? The technology we use works to lift and tighten skin, reduce damage from acne scars, and improve the tone of the neck bands while also providing preventive care for fine lines and wrinkles leaving you with a refreshed youthful glow in only a few simple treatment sessions. We generally recommend 5 treatment 2-3 weeks apart; results can be seen as early as 1-2 weeks and peaks at 3 months. This treatment is suitable for all ages and skin types and can be done in combination with other treatments.